Just Listed at The Collection! ✨Just Listed! Open Sunday 7/1 from 12-5pm! *Photos are of model home. As more luxurious new single family homes come available for move-in in Playa Vista, I wanted to repost a blog I wrote when I started selling homes for Brookfield Residential about my weekend stay in this incredible community. I hope this helps give potential buyers, especially ones that live outside of the area a glimpse of what this oasis in Los Angeles is all about. I completely fell in love with the Playa Vista lifestyle after staying at one of Brookfield’s new luxurious single family homes over the weekend. There are many reasons why living in Playa Vista is incredible. Everything you need is within walking distance - A Cinemark Movie Theater, Whole Foods, CVS, Yoga Works, Mellore clothing boutique, Varnish nail salon, Beauty Beach Lounge hair salon, Bike Attack bike shop and much more. There are an assortment of restaurants for all tastes. There are parks for your kids and parks for your dogs. There are hiking trails, The Resort, which is a state-of-the-art fitness center with sparkling pools exclusively for Playa Vista residents, and a shuttle to the beach. Oh, and the most efficient urgent care I’ve ever been to. I arrived with my son on a Friday evening. Walking into the expansive and bright living space, we felt instantly at home. There is nothing like being in a new and beautifully appointed home with a clean, fresh, and relaxing palette. After putting our clothes away in the large walk-in closet in the master suite, we decided to walk over to the Cinemark theater to see a movie. It took less than 5 minutes to walk there, with a quick stop to pet a few friendly dogs. Playa Vista has a small town feeling; everyone you meet is incredibly friendly. It’s like living in an oasis in the middle of a bustling city. What I love about Cinemark is that they have food options other than hot dogs, candy, and popcorn. You can get salads, burgers, and pizza, among other things. They also serve alcohol which is much appreciated after a long work week. My relaxing weekend in Playa Vista had begun. After the movie we decided to make a quick stop at Whole Foods to buy some pastries for the early morning. We also made a stop at Starbucks to sit out by the fire pit to have a chat about the movie. Not only is the Playa Vista community extremely walkable, but I feel safe strolling around in the evening. The HOA dues includes community patrol; I felt completely at ease walking home with my 7-year-old, something I do not feel in other areas on the Westside. On our way home we had a nice view of the LMU clock tower illuminated on the hill. We stopped by one of the many parks on our way back to watch the light-up fountain. There we met a few kids who were hanging out with their parents and playing before we headed home to bed. After getting in our PJ's we cuddled up on the sofa to read a book. I love having an open floor plan with an expansive kitchen and living room. I really liked the fact that the bedroom has a 3/4 bath on the first floor of the home we stayed at. If you have guests staying with you, they have their own private living space and outdoor area on the first floor. The other bedrooms are on the third level which gives a nice amount of privacy from your guests. Sleeping was extremely peaceful with a view of the moon through the high, wide windows. Another nice feature of this home was the ample outdoor space and outdoor fountain that lulled us to sleep. We got up early Saturday morning to take a bike ride up to the bluff. My son is a big fan of YouTube so we took some fun shots of the YouTube sign on our way. Playa Vista is Silicon Beach central with companies such as Facebook, Google, YouTube, and many more setting up offices in the area. If you work at any of these companies and live in Playa Vista you can walk or ride your bike easily to work and give your car a rest. After our outdoor adventure we had a yummy breakfast at Panini which is only a block away from our weekend home. Then it was time for me to start preparing for the evening's cocktail party. On the second level, the kitchen, living room, and balcony combine to make an expansive space that is great for entertaining. I ordered the food online from Whole Foods which made preparation minimal. The staff at the Playa Vista Whole Foods is extremely helpful. I was in and out in less than 30 minutes with food, drinks, and gifts for my guests. The huge island in the kitchen gave me ample room to set up my cocktail party goodies. My last step was putting on some surround-sound music. My guests were wowed by this beautiful home and had a great time. 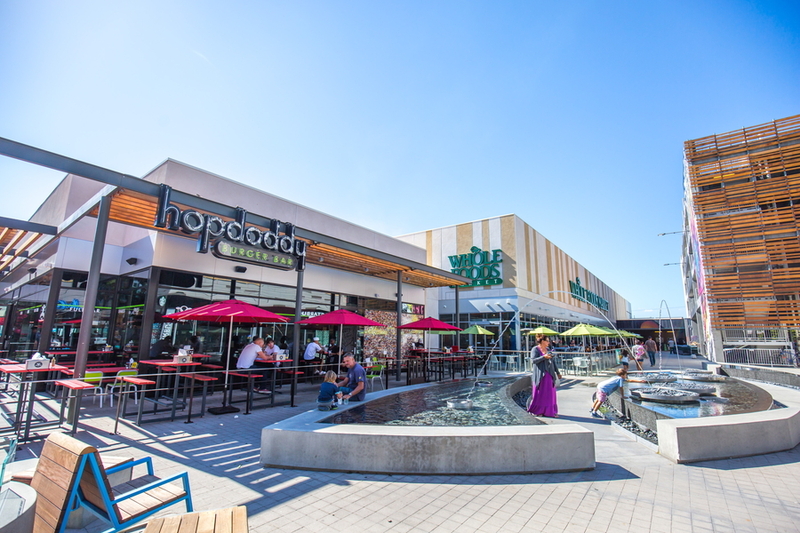 Playa Vista is an oasis in Los Angeles with a laid-back, small town feel. There are many living options coming out of Phase 2 that can work for different lifestyles and budgets. If you want a single-level floor plan you have Skylar, Cleo, and Mason to choose from. The Collection and Jewel offers multilevel single-family homes with versatile floor plans and nice outdoor spaces - with options like outdoor kitchens and fountains. A Playa Vista resident recently said it best, "I went to the gym, went and got a smoothie, went to the bank, went to the doctor, went out to dinner and never got in my car." This is what it's all about. If you would like to take a tour of these beautiful homes, or the general area itself, please give us a call 310-945-6365, or visit us at petsuproperties.com.